I thought i'd share another hammer i made - i actually put this together when i started to knap a couple of years ago and had no antler for softer hammers etc. It cheap and easy to make, and works well , though i have not used mine for quite a while as i like antler so much. It's a good tool for a beginner who can't afford or acquire antler or a bopper etc. I think i've christened it 'The Pennyhammer' as that is what the handle is made of, simply as they add plenty of weight and i have 2 Whisky bottle tubes full of the things. 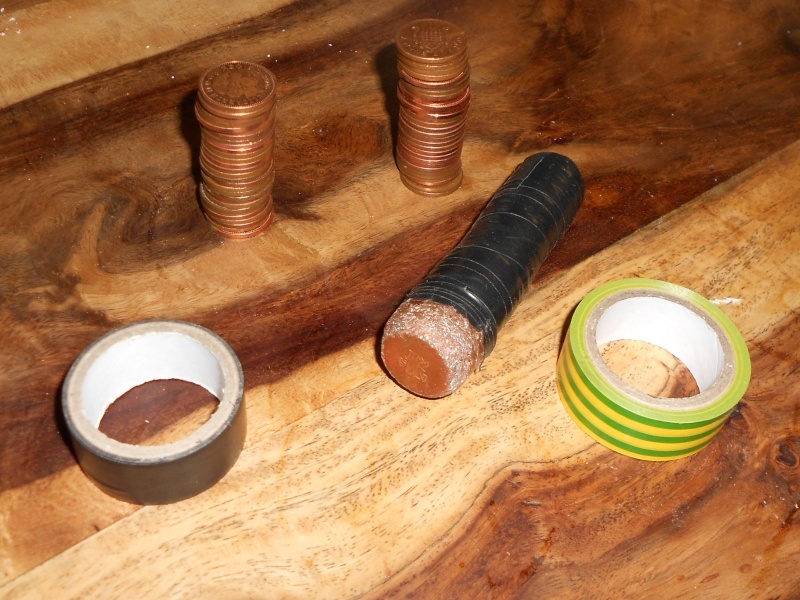 All you ned is about 50x1p coins, a 22mm plumbing copper end cap (probs under £4 for 2 at Wilko's) and a roll or so of insulating electricians tape (five rolls for £1.50ish, Wilko's again). The example in the pic is a short one, maybe only 30 coins; i was making a longer one tonight with 50 coins but then realised i'd used my last cap, so i thought i'd share the idea instead. 50 coins for a handle feels better though - long enough for a better swing if needed and pretty darn weighty too. 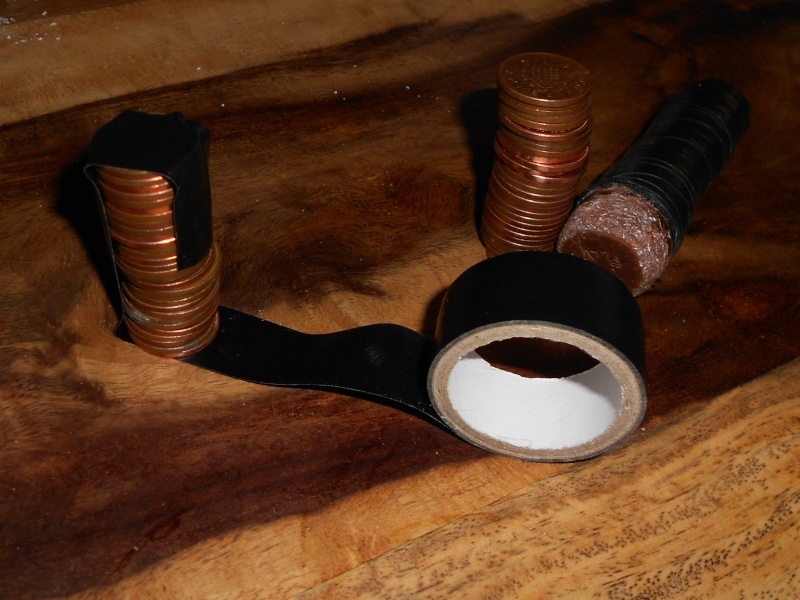 50 coins is just to darn fiddly to wrap with tape like this, so do 25 at a time and then combine them, wrapping as before etc so they are plenty secure. Dont over wrap with so much tape that the end gets too thick to fit the end cap on at all, as that is all that's left to do. It needs to be flush of course, and if not, a few extra layers of tape under it will sort that. 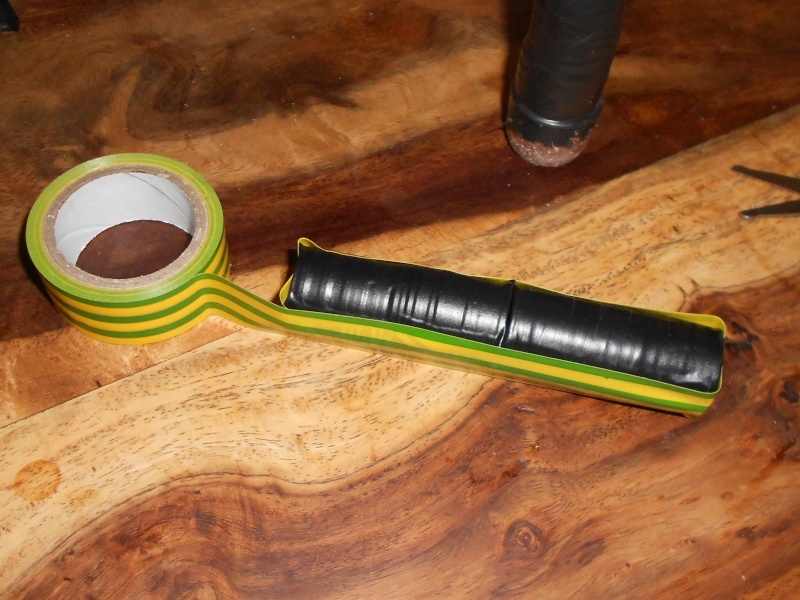 Then push the cap on, and add a little tape wrap over the join if you like - i have and it doesn't get hit and cut up much when i used it, and it's had a fair bit of use and tape is easily replaced after all. You could also put a bit of epoxy in the cap too before putting it on though i have yet to try this, maybe it would melt the tape, idk. I have also made one out of pennys and a 2p one but I tig weld to make the end section then round with a grinder. 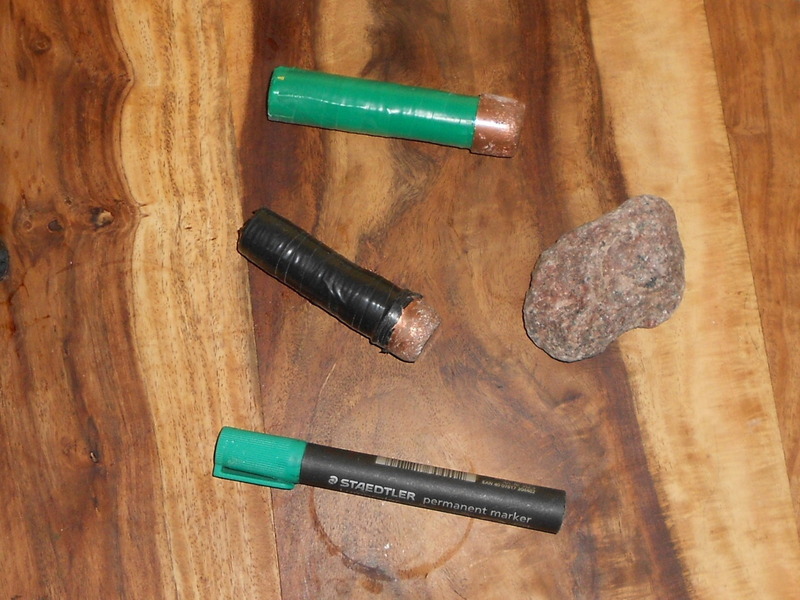 I have a magnet in the house and sort the copper penny's from the iron ones first. Pre 1990 copper coins are all copper, the ones after have a steel core. 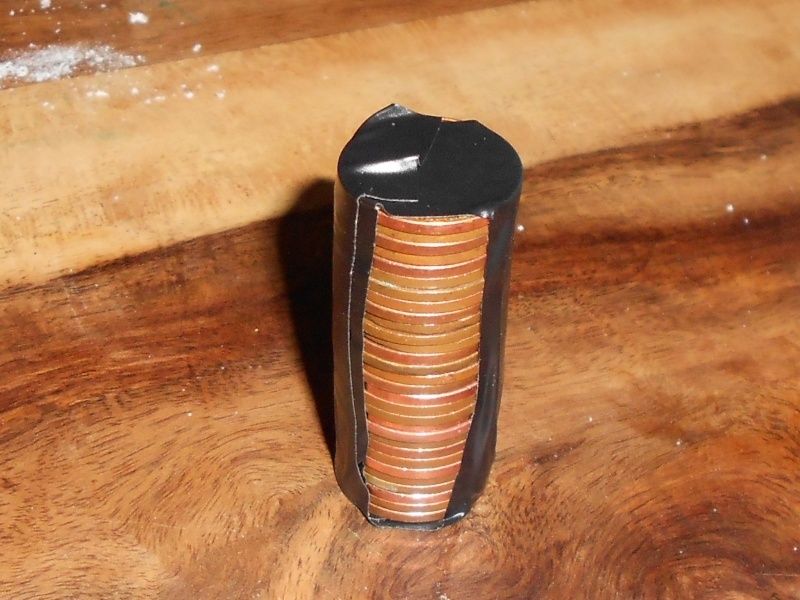 I like the penny bopper, I have domed a copper coin and put it under the end cap before adding the lead to make the cap last a bit longer, but making the entire handle from coins is a new one on me! A bopper is usually a copper cap filled with lead on a wooden stick and a soft percussion tool, an all copper tool is a billet and a hard percussion tool, doing this way seems to be closer to a billet than a bopper. Billets tend to be used for taking large flakes off nodules or huge spalls but not used on small pieces because they create large bulbs of percussion. Billets are expensive so this seems a really good cheap way of making one. How do you usually use them Skalla, how do they perform? Hey folks - i have not used this one for quite a while but have found an old cap and finished the longer one (50 coins) which feels a touch more potent, though i'm away from home for a few days and have not tried it yet, though i may well next week. I actually got the idea from Marq Lundt's Egyptian Knapping vid - not that i ended up using it that way so far.... i've used it for both soft and hard hammer strikes though. For hard-hammer strikes i felt it left a smaller bulb than stone, and it worked fine for soft-hammer too though it did not get extensively used as such and i was very novice at the time. 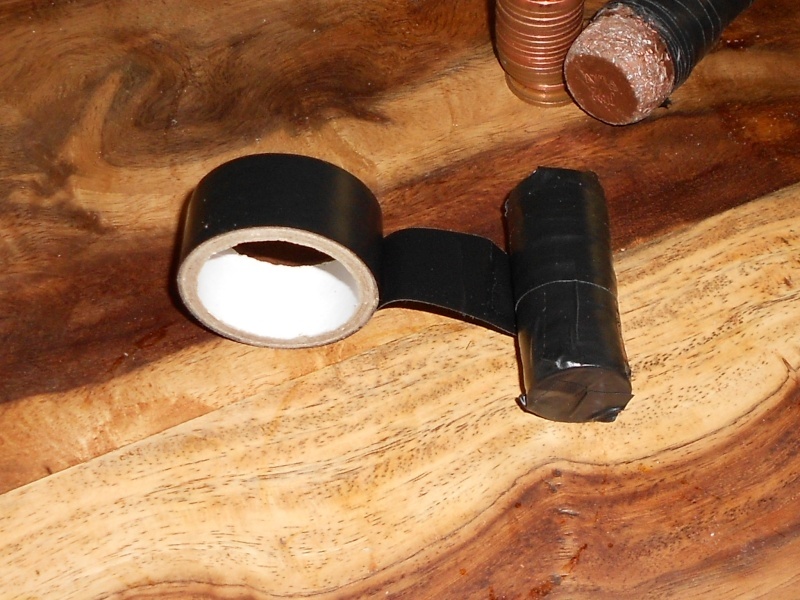 I think that the fact that the coins are bound in tape helps, as it allows a very slight flex in the handle on impact - perhaps this helps the soft hammer action. And i did not know about pre 1990 coins being much higher in copper - i have magnets around the place that my boy plays with (ok, both of us!) and we often use coins with these...i'll have to sort through the coins and look for older ones to experiment with. Very interesting that you had a similar idea, Barnacle - how do you use yours and how are the results? I never thought of making a 2p hammer either (duh), i'll have to get some bigger caps! I only made it a couple of weeks ago so have not had a good go yet also the flint I have is not the best. I got the idea while my lad was counting is pennys out for the bank and putting them in piles, the queen might not like it but I have thought of seeing if I can smalt some into a heavy billet. I'm thinking the same.. i've saved some scraps of copper from scavving for that eventual purpose and perhaps older coins can supplement that. Finally home again, and have epoxy'd an old cap onto my new 50 penny hammer... not tested yet, and the glue may take a while to set. Older coins are 97% copper! v cool! me and my boy sorted through the coppers this eve and have a chineses take-away tub full of old non magnetic ones, presumably 97% copper. I'm no metallurgist/smelter etc, but i reckon a blowtorch should melt them into a good lump. Looks like i need a blowtorch! What do folks think...would they need to be annealed (or whatever), ie slowly cooled, such as in an oven etc? i may well do some more research on this. I think copper melts at around 1200 degrees C a good blow tourch would do it, alternativly do you know any blacksmiths with a forge near you? i do know a blacksmith from my old workplace, but after nearly 10 years of the place i dont feel like going back any time soon! Forges are very easy to make though - a barbeque, charcoal and a hairdryer is all that needed, plus a ceramic crucible/melting pot which is the only part that would need some experimentation/research. a simple clay pot may even do it.